It's finally October which means its officially Halloween Month! This is one of my favorite months for many reasons. I love the bewitching spooky vibes, all of the decor, sweet treats, everything pumpkin, and of course Halloween movies! Every October Rudy and I try to watch as many of our favorite Halloween movies as we possibly can. This year I suggested we try and watch at least one movie a day. I wonder if that will be possible given both of our crazy work schedules, but it will be fun to try! 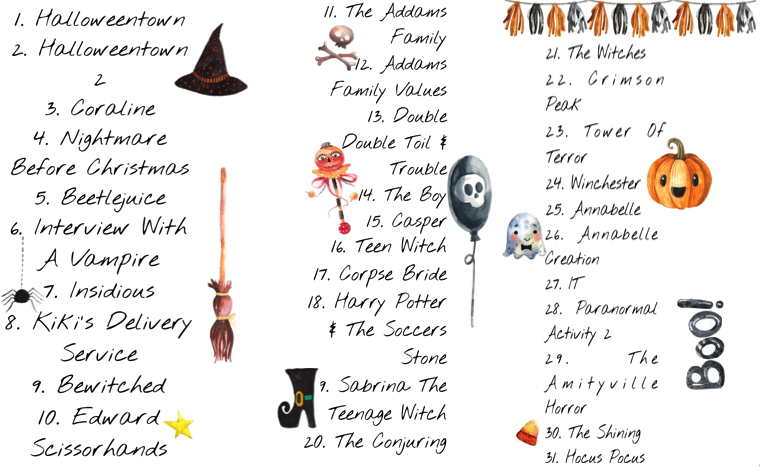 Down below I have a list of thirty-one Halloween themed films. These are the films we will be trying to watch up until the last day of the month, Halloween day. Most of the films are favorites of mine and Rudy's and we even added a few films that neither one of us have watched. Let's begin! I definitely saved Hocus Pocus for last since it's my favorite Halloween movie. However, that doesn't mean I won't be watching it multiple times before that. What is your favorite Halloween must-watch movie that I didn't add to my list? I always love watching Hocus Pocus on Halloween too! I'm interesting in knowing which movies you haven't watched on this list, we must discuss them! I can watch it over and over without ever getting sick of it, you know what I mean ;) I added two movies that I haven't seen yet for the end of the month and I really hope I enjoy them haha. Girl, thank you so much for sharing this!!! Last night I was sitting with my youngest sister, and we simply couldn't think of a spooky movie to watch that we hadn't seen yet. Halloweentown will forever be my favorite!!! Yay I’m so glad you enjoyed this post Madison! Halloweentown definitely brings back memories from my childhood which I love. HALLOWEEN IS MY FAVORITE!!! Is it bad I like halloween movies better than christmas movies?! Haha! My favorite is Beetlejuice and Hocus Pocus! Sometimes it's too hard for me to choose. Hocus Pocus is definitely my number one for Halloween movies.